South Carolina workers' compensation provides medical benefits and lost wage compensation to South Carolina workers who have been injured on the job. Workers' compensation has eliminated the right of the South Carolina worker to sue their employer for damages resulting from a work injury and instead provides immediate relief regardless of who caused the work injury. Workers' compensation is administered by the South Carolina Industrial Commission which was established in 1935 to enforce South Carolina's workers compensation laws. Workers' compensation allows both the employee and the employer to avoid lengthy court battles and is considered a trade-off for both the employee, who potentially forfeits higher monetary benefits, and the employer, who is required under work comp laws to pay for South Carolina workman's compensation for the majority of South Carolina employees. Many workers who are injured at work may find that their employer is more concerned with closing their South Carolina workman's compensation claim and less concerned with ensuring they receive adequate medical care and wage loss compensation. If you have been permanently or severely injured at work or if you have been denied South Carolina workers' compensation benefits, contact a workers' compensation attorney from South Carolina who understands your legal rights under South Carolina work comp law and can ensure you get the workman's comp benefits you deserve. 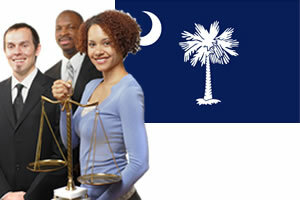 Need legal help getting benefits for your South Carolina workers compensation case? Simply complete our free form below to get started today! Back and neck injuries, Abrasions and burns, Amputations of arms or legs, Heart attack or strokes on the job, Diseases caused by inhalation of chemicals or other toxins, Bone fractures, Carpal Tunnel Syndrome, Hernia, Torn Rotator Cuff, Torn Meniscus, Bulging disc, Stroke, Concussion, Asbestosis exposure, Post Traumatic Stress Disorder (PTSD), Chronic Obstructive Pulmonary Disease, General Anxiety Disorder. If the South Carolina work injury is caused by the employee's intentional actions to injure themselves or another employee, with disregard to standard safety procedures, while intoxicated or while travelling to and from work it may be difficult to receive South Carolina workman's compensation benefits. If you have been denied workers' comp benefits for your South Carolina work injury, contact a South Carolina workers' compensation lawyer. South Carolina workers' compensation benefits can include: medical benefits, temporary total disability benefits (TTD), permanent partial disability benefits (PPD), temporary partial disability benefits (TPD), permanent partial disability benefits (PTD), death benefits for surviving beneficiaries and vocational rehabilitation benefits. Medical Benefits - Paid medical care is provided to South Carolina workers who suffer an injury at work. Medical care can include all necessary and reasonable medical care to treat the work injury or occupational illness including: doctor's visits, hospitalizations, laboratory services, medical supplies and prescribed medications. South Carolina employers can select the treating physician for injured employees. Talk to your employer prior to seeking medical care for a South Carolina work injury. Temporary Total Disability Benefits (TTD) - Temporary total disability benefits (TTD) are provided to South Carolina employees who sustain an injury at work and are temporarily unable to return to their job. TTD benefits are not paid until the South Carolina employee has missed more than 7 days of employment. If the South Carolina worker misses more than 14 days of employment, compensation is paid for the first 7 days of lost employment. TTD benefits are paid at 66 2/3% of the worker's average weekly wage but no more than the average weekly wage allowed by the South Carolina Employment Security Commission. TTD benefits are paid for a maximum of 500 weeks or until the claimant reaches their maximum medical improvement and is able to perform gainful employment. Permanent Partial Disability Benefits (PPD) - Permanent partial disability benefits (PPD) are paid to South Carolina workers who sustain an injury at work, are able to return to some type of work but who have partial and permanent disabilities. PPD benefits are paid at 66 2/3% of the employee's wages (up to the state's maximum allowable amount), but the duration of payment can vary depending on the type of workplace injury. Some work injuries are scheduled. For example, South Carolina workers who lose the use of their arm may receive up to 220 weeks of PPD benefits. PPD benefits for non-scheduled injuries can be paid for a maximum of 340 weeks. PPD benefit compensation can be calculated by multiplying the worker's percentage of disability, the value assigned to the body part which is lost and the South Carolina worker's compensation amount. Temporary Partial Disability Benefits (TPD) - Temporary partial disability benefits (TPD) are paid to South Carolina workers who have been injured but who are able to return to light duty work. TPD benefits are paid at 66 2/3% of the difference between the worker's average weekly wage prior to their South Carolina work injury and their current wage. Permanent Total Disability Benefits (PTD) - Permanent total disability benefits (PTD) are paid to South Carolina workers who sustain a work injury and are totally and permanently disabled and unable to return to any type of work. PPD benefits are paid at 66 2/3% of the worker's wage up to the state's maximum allowable amount. PTD benefits may be paid for a maximum of 500 weeks, unless the work injury results in brain damage or the worker becomes paraplegic or quadriplegic. According to the South Carolina Workers' commission, "the loss of both hands, arms, feet, legs, or vision in both eyes, or a combination of two such losses, constitutes total and permanent disability". Death Benefits - Death benefits are paid to the surviving dependents or the spouse of the deceased worker. Death benefits can include lost wage compensation payments and burial expenses up to a maximum allowable amount under South Carolina state law. Vocational Rehabilitation Benefits - Vocational rehabilitation allows the injured worker the opportunity to rebuild their work skills as they recover from their workplace injury and hopefully return to their previous job. Workers who are unable to return to their previous work due to physical or mental limitations may receive additional vocational services such as retraining or job modification. Laws vary by state but in most cases the state, the insurance company or the employer will provide or pay for some type of vocational rehabilitation services to help injured employers return to work.